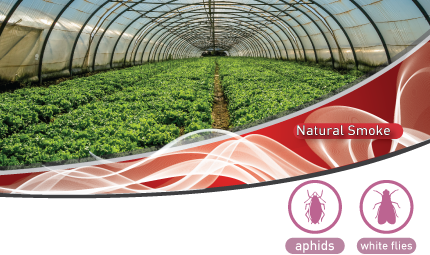 BioFume™ Greenhouse smoke generator offers a natural pest management treatment for sensitive areas without the need of conventional pesticides. This natural smoke contains garlic oil, which is a known plant nutrient. Garlic oil stimulates the plants’ natural processes to produce a balanced healthy growth. By adding garlic to a smoke it is evenly distributed throughout the greenhouse giving all the plants the extra nutrients they need to boost their natural defences against disease and fight off insect attack. Garlic has been used since the 16th century to ward off ailments and pests. Also, it is a powerful tool in the fight against pest on commercial crops without contributing to environmental contamination. 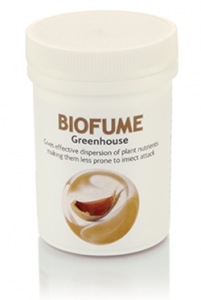 BioFume Greenhouse Garlic Smoke is an easy-to-use fumigator with all natural ingredients that will not harm but BOOST the health of your plants/crops. Where to use BioFume Greenhouse Garlic Smoke Generator? The use of BioFume Greenhouse Smoke Generator may be subject to local regulation and a registration may be required. Please check with your local authorities or contact us to know more about the registration in your country.